Easy to handle, simple to operate, Cyclops L portable non-contact pyrometers provide precise temperature measurements. Easily take measurements in multiple locations and verify on-line pyrometer readings. Durable, yet light weight construction means you can operate it for hours at a time without fatigue. Designed for single-handed use, Cyclops L’s high-resolution lens sighting and an ergonomic one-handed use design, make it simple for you to take safe, accurate temperature readings in hostile environments where you will have a spare hand to steady yourself. With four, trigger-controlled data-logging modes available, Cyclops L stores up to 9,999 readings internally. Later the recorded data can transferred via Bluetooth or USB to a PC running free Cyclops Logger software to view, analyse the temperature readings. Several models are available for the specific process challenges of liquid metal, high temperature, medium temperature and furnace applications, Cyclops L provide highly accurate temperature measurements for the glass, hydrocarbon processing, industrial processing and steel industries. Cyclops L function for extended periods, with on-board data storage allowing up to 9,999 measurement points to be recorded inside the thermometer. A rugged instrument jacket protects Cyclops L against harsh conditions. Cyclops L range is easy to use – High quality, Through the Lens (TTL) sighting means that you simply look through the eyepiece and focus the lens on the desired target. A small graticule within the view exactly defines the area that's being measured. Then simply pull the trigger. Switch between four modes for data-logging. Temperature readings are displayed within the eyepiece and simultaneously on a second display panel on the instrument's side. This allows a colleague standing next to you to also view the readings. Wireless Bluetooth data transmission further enhances the Cyclops operation. Ideal for regular monitoring of sites with multiple measurement locations and verifying readings of permanently installed pyrometers,. 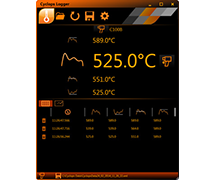 Free to download Cyclops Logger software provides configurable measurement routes for your process, uploadable to your thermometer. Pre-configured settings include emissivity and window correction for each measurement location. AMETEK Land’s portable Cyclops L family is available in a range of models. Weight 0.83 kg / 1.8 lb. Free software utility enabling Cyclops L portable pyrometer users to view, analyse and save measurement data. 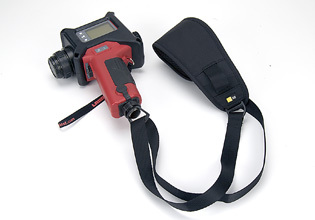 The Cross-body Portable Pyrometer Sling keeps the Cyclops L tight against your body to prevent swinging, bumping or accidental drops and makes it easily available for taking a temperature measurement.